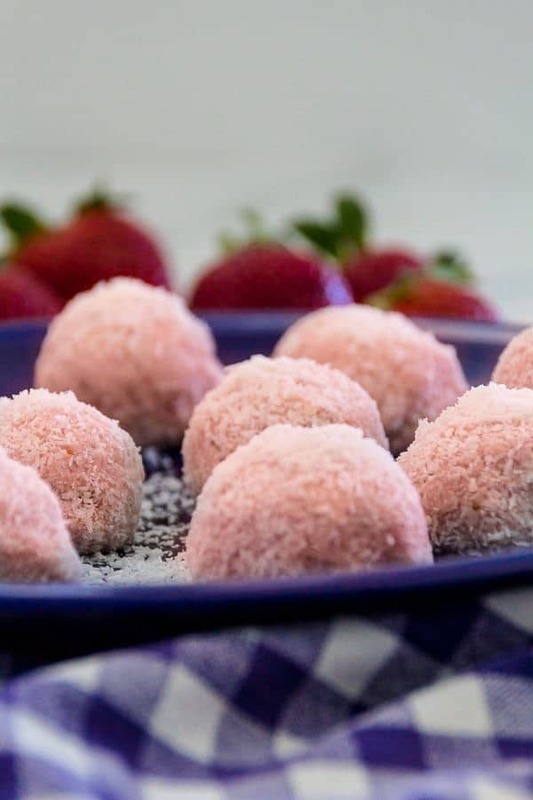 Low-Carb Strawberry Cheesecake Energy Balls will delight kids and adults alike. Fresh strawberry and coconut flavors combine with a smooth, creamy texture to create the perfect summer treat. Are you a snacker? I have to confess that I am a bit of a snackaholic and haven’t been able to give them up since going low-carb a few years ago. I don’t really try anymore as there are lots of great low-carb snack options. The recipes for fat bombs are great but sometimes they are just too rich to eat for afternoon tea! Enter Energy Balls…. Something lighter like these Low-Carb Strawberry Cheesecake Energy Balls are just the thing. Apart from being an excellent snack, these energy balls are great for kids parties or as an after dinner treat. The sweetness of the strawberries used will make a big difference to the flavor. 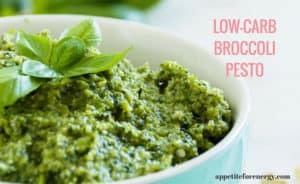 Start by adding 1 tablespoon of low-carb sweetener and then taste the processed mixture to see if you need to add more. When strawberries are really sweet, you may not need any sweetener at all, so feel free to leave it out altogether. For more information on choosing a low-carb sweetener, check out our post: Low-Carb Pantry Essentials. The kids are also a big fan of these so make a double batch so everyone can enjoy them. They can get involved by rolling the mixture into balls and coating them in the shredded coconut or even better, desiccated coconut. Desiccated coconut is shredded coconut that has been processed in a food processor into fine, sand-like grains. If you only have shredded coconut, it can be blitzed in a food processor to create the finer, desiccated coconut. The desiccated coconut is great for rolling the energy balls in. The shredded coconut tends to be a bit too clumpy but will have the same flavor. It’s an easy recipe to get the kids into cooking and have a bit of fun. Just be prepared to have shredded coconut all over the place! 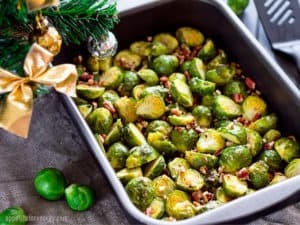 You’ll love this recipe if you want something uncomplicated that can be prepared in 15-20 minutes. They are the perfect snack when you need something to get you through the afternoon. I like to have one or two with my afternoon coffee. 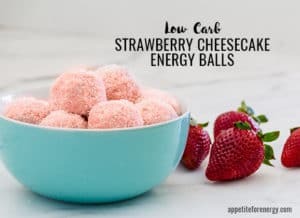 Low-Carb Strawberry Cheesecake Energy Balls would also be great to serve when friends come over or after dinner. Want more low-carb snack recipes and ideas? If you are looking for more snack ideas, check out our 101 Low-Carb Snacks Guide. Have you discovered Yummly yet? Yummly is a wonderful FREE new recipe sharing and collecting platform. Yummly searches recipes from across the web (and world) to find what you’re looking for. It has a great search feature which allows you to search by cook time (30 minute meals anyone? 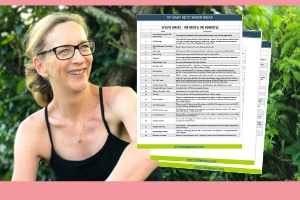 ), technique, or for recipes by holiday, cuisine, taste, diet, nutrition, allergy, and more. It makes it so easy to find what you’re after. Then simply save your recipes to your recipe box and start your collection. Recipes can be saved directly from your favorite websites to Yummly. You’ll see the orange YUM share button on the image or when you hover over the images in all our recipes. Try it out above by clicking the YUM button to save this recipe to your Yummly recipe box. Your recipes can be organised into collections too. You can name them whatever you want eg. “Bacon Desserts”, “Bacon Salads” ‘Bacon & Butter”. You get the idea! Check it out here (it’s free) and make sure you try out their handy search feature which I consider to be one of the standout features of Yummly. Don't give up snacking! These Energy Balls are a delicious low-carb snack, awesome for kids parties or as an after dinner treat. Only 20 minutes to prep and 1.8g of net carbs per ball. Place the strawberries, almond flour, sweetener (erythritol) and a pinch of salt into a food processor. Break or slice the cream cheese into small pieces and add to the food processor. Add 3/4 cup of shredded coconut, reserving 1/4 cup for rolling. Process on high speed until well combined, scrape down the sides and process again. Shape the mixture into 12 balls (around 1 inch size) and roll in the coconut to coat. 1 serving is 1 ball. Best when chilled for 30 minutes or more, but can be eaten immediately. These sound so refreshing and perfect for spring!! Loving the strawberries with coconut!! I personally don’t like coconut, what could I replace it with? Really excited to try this recipe! The coconut does provide a lot of the bulk so to replace 3/4 cup, try using 1/4 cup of almond meal (in addition to the 1/2 cup in recipe), then perhaps use 1/4 cup white chia seeds and 1/4 cup of crushed/chopped nuts. You could use finely chopped pistachios or another nut to roll the finished balls in instead of the coconut or don’t finish them with anything. Let me know how it goes! If I wanted to replace the erythritrol with stevia would you recommend using the same amount? Stevia is more concentrated than erythritol so you need to use a lot less. I would suggest using about 15 drops of liquid stevia or 1/2 tsp of stevia powder. Add this to the mixture and taste it before deciding if you need to add more for sweetness. It can be tricky getting the stevia to mix evenly through the mixture as it is such a small quantity. It is sometimes easier to work with erythritol as the quantities used are more similar to sugar. Could you use frozen strawberries that have been thawed? Yes – you can use defrosted frozen strawberries for this recipe. As long as they are thawed fully it should work out fine! I tried this recipe today to take to a weight loss group. I really like the flavour but I did use thawed strawberries and it seems the batter was really loose so I added a bit more almond flour and this did not help so I added a couple tbls of coconut flour and it helped make the batter a bit thicker. I put them in freezer for 1/2 hr and they are nice and firm. Like I said really like the flavour and want to try with fresh strawberries now! Thanks for sharing this recipe, sometimes I need a healthy seeet fix and this did the trick! I’m so glad you liked the recipe and were able to modify it to work for you! 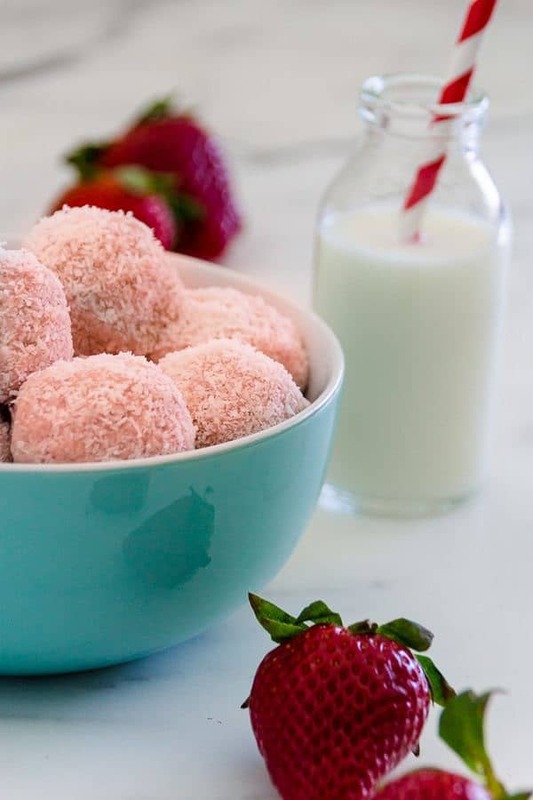 The recipe works well with fresh strawberries so you shouldn’t need to add extra coconut flour- but do whatever you need to do to get the right texture.